The instructional guitar game will lower the tone later this month. When it first hit stores in 2011, Ubisoft's educational guitar game Rocksmith was limited to the standard six-string guitar, forcing players to play either lead or rhythm and leaving bassists out in the cold. The company intends to rectify this in the very near future by offering players bass compatibility for the game. 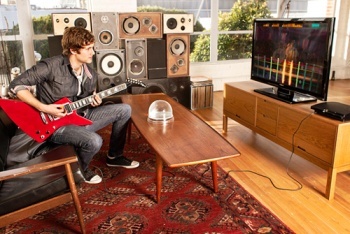 Rocksmith's bass expansion will be available for both the PS3 and Xbox 360 versions of the game on August 14. It will be priced at $29.99, and will include bass arrangements for every in-game song featuring the instrument, including already-purchased DLC tracks. The update will also offer dedicated bass training, with techniques such as two-finger picking, slapping and popping, and the game will track players' progress on the guitar and bass separately. Players without a bass haven't been left out either. As the tuning for a bass is simply an octave down from the lowest four strings of a standard guitar, the expansion will allow potential bassists to plug in any regular guitar with a quarter-inch jack to emulate its four-string counterpart. For those who don't already own the original game, Ubisoft plans to release a bundle on October 16 that will include both guitar and bass segments of tracks, and this release will be simultaneous with the game's PC release. Rocksmith has yet to see the light of day outside of North America, but is tipped for a European release on October 12. It doesn't look like Ubisoft intends to stop at bass support for Rocksmith. Lead audio designer Nick Bonardi recently told Polygon that he "[doesn't] feel like we've fully tapped the experience to its fullest." The main drive for the bass expansion was a vocal desire from fans, and Bonardi hopes to continue this trend moving forwards. "Depending on what the fans ask for," he said, "we can add other things to it. Hypothetically - anything that creates a frequency can be plugged into Rocksmith and played." Could this mean that we might one day see a mandolin or ukulele expansion for Rocksmith? Only time will tell.